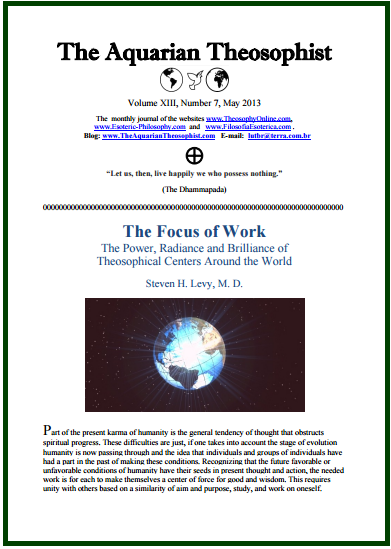 The opening article of the May 2013 edition is “The Focus of Work”, by Steven H. Levy, M.D. It examines the power, the radiance and brilliance of theosophical centers around the world. Following that, we have an illustrated fragment called “When Action Produces Joy” and an insightful report on humbleness, narrating “The Wise Sayings of a Fool”. On pp. 4-7, the reader finds the extraordinary text by John Garrigues entitled “To the Man in the Street”. 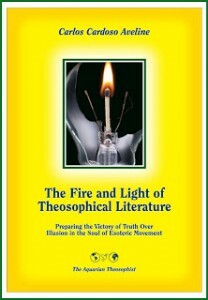 The List of New Texts in www.TheosophyOnline.com and associated websites is on p. 8. The Aquarian presents “On Listening to Our Own Voice”, a classic Taoist fragment by Eva Wong. Pages 10-11 present various illustrated quotations. On pp. 12-17, a polemical essay by George Orwell, written in 1949, discusses what is right and wrong in Mohandas K. Gandhi and his social reform in India. It’s called “Reflections on Gandhi” and its subtitle says: “Saints Should Be Judged Guilty Until They Are Proved Innocent”. The edition closes with a practical invitation to those who want Universal Brotherhood to emerge in a quicker way in the present world scenario.